You'd better believe we won't drink THIS water! Unfinished Moai in the Rano Rarku volcano. 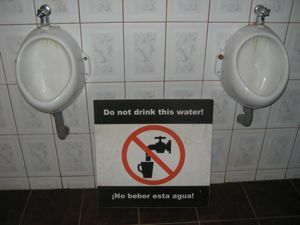 Travelers are often told not to drink the water. It's often good advice, but really.... this sign seemed to warn of the obvious don't you think? We were on Easter Island, driving around to see the majestic Moai (those monolithic statues that the island is known for). We had just seen the group at the restored archeological complex of Tongariki, and we were ready to explore the "Moai Nursery" at the Rano Raraku volcano when Mark found this sign. We couldn't resist. 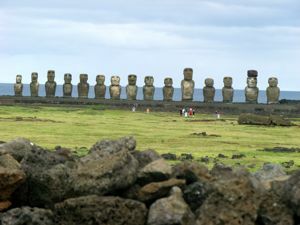 There's all kinds of speculation about where the early settlers came from and what caused them to stop building the Moai. 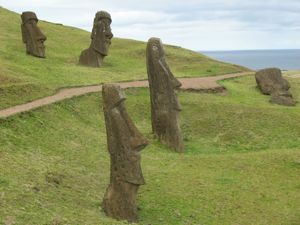 Could it be that this is what caused the down fall of that ancient civilization on Rapa Nui? OK... we know that's not true, but it IS a funny sign. Is The Water Safe? and Bottled Water for Travel. And while you're at it, since we're sort of on the subject of what you might find when you travel to the corners of the world... take a look at what we have to say about Foreign toilets.